CRAZY DISCOUNT! Was: $649.95 Now: $239.98! 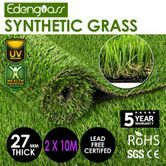 Rewarded as the top seller and most economical landscaping grass, 2M x10M Artificial Grass Synthetic Turf 27mm is going to achieve your dream of having a perfect lawn all the year round as well as saving maintenance cost! We offer four colors of flat grasses while there is no difference between every type of grass in the market, and thus our product is more natural and genuine. It is well suited to decorate domestic and commercial landscaping, such as gardens, courtyards, roofs, playground, shops and swimming pools, balcony, kindergarten, stadium and so on. High-density materials and anti-fading yarns mean that our fake lawn has good weather resistance and UV stability. Its bottom is composed of three layers of base cloth with composite grids, ensuring the high draining capability. 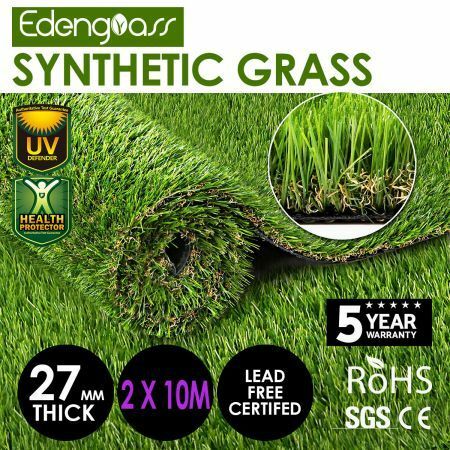 In addition, after successfully passing UV 3000 hours aging test - simulating whether can keep evergreen in 7-8 years at high sun exposure areas, the lawn is proved to protect against UV degradation to the maximum level. Obviously, our unique artificial grass with oval shape is more durable and long-lasting than similar product on the market. Absolutely impressed with the quality of this grass. Its hardy and looks just like the real deal. Very soft to walk on and easy to lay. Will be ordering more when we can highly recommend this to everyone you wont be disappointed Needed an area for the kids to play that was prickle free and needed no water so this is perfect for what we needed.